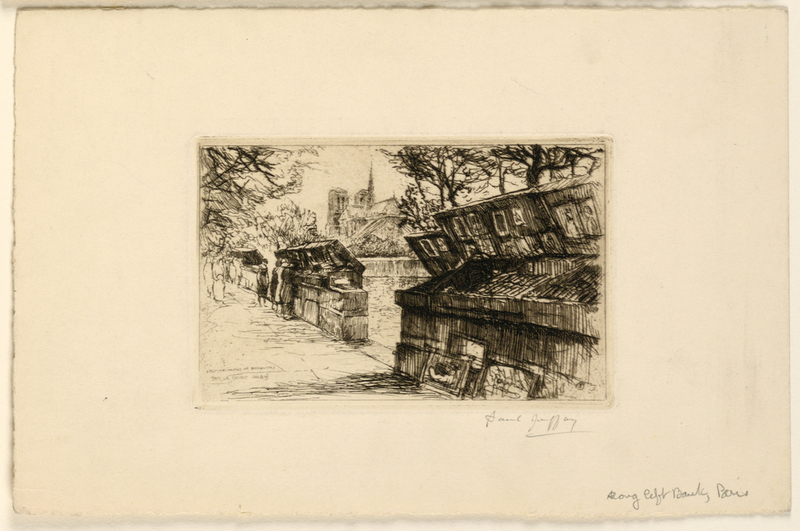 This lithograph, by artist Paul Jeffay (1898-1957) depicts the Left Bank of Paris, France, on what appears to be the Quai de la Tournelle. The main focus of the piece is on the bouquinistes, green boxes that line the Seine in the center of Paris, out of which booksellers sell used and antiquarian books. In the distance, beyond the bouquinistes, Notre Dame is clearly visible, as viewed from the east with the building’s flying buttresses beautifully shown. The bouquinistes fold up into small green boxes during the night, but here they are shown open and ready to sell their wares. They line the sidewalk, sometimes so dense you need to strain to catch a glimpse of the Seine flowing just below, but who can be mad as you browse through these fantastic book kiosks. It’s all the allure of a used-book store right out on the streets of Paris. They are charming icons of Paris, and are now a part of a UNESCO World Heritage site. Out of these small kiosks vendors sell postcards, vintage prints of Paris monuments, used books, and more, to the Parisians, tourists, and flâneurs who are wandering the streets of the city. The artist of this lithograph, Paul Jeffay, was born under the name Saul Yaffie. He took on the pseudonym of Paul Jeffay during his time in Paris in the 1920s. Yaffie’s parents were Russian immigrants who fled Russia during the anti-Jewish pogroms of the 1880s and settled in Glasgow, Scotland. Saul Yaffie, born in Glasgow in 1898, attended the Glasgow School of Art from 1912-1919. It was during his time at art school, however, that World War I broke out. Yaffie took leave of his studies to serve in the war effort. After the war, and after finishing his studies at the Glasgow School of Art, Yaffie moved to Paris. Paris during the 1920s is, of course, renowned for being a hub of artistic activity and jazz society. It was during this time that Yaffie started signing his art as Paul Jeffay. Once the roar of the Paris jazz scene dimmed and the threat of World War II loomed near, Jeffay, a Jewish artist, decided to leave Paris. He fled with his wife, Estusia, to Manchester, UK, where they remained until after the war, when they moved back to Paris.